Eight years after the release of A Dance With Dragons, the fifth book in George R.R. Martin’s A Song Of Ice And Fire remains its last. Martin has been promising the follow-up, The Winds Of Winter, to readers almost since he finished Dance, but in the time since, the questions and answers have taken on a certain rote quality. A Song Of Ice And Fire is popular; Game of Thrones, the TV adaptation of the novels, even more so. That means there will always been an audience eager for news, regardless of whether or not that news has actual merit. Publishing rumors and hearsay about Winds’ progress has become something of a cottage industry online, and it seems like every few months there’s some new sign that the book might finally be finished. He’s feeling optimistic! He’s gotten through a tough patch! He has a special cabin in the mountains where he does all his best work! Strip away the hype, though, and it’s easy to see that Martin is still saying more or less what he’s always been saying. The novel is hard work, he’s still at it, fingers crossed, etc. And that’s not hard to believe. With each volume in the series, Martin had raised the stakes, adding characters and subplots to a narrative that was already straining to keep pace by book four. Trying to pay off all that set-up and reach a satisfying conclusion without being able to go back and tweak earlier volumes was, I wrote at the time, almost impossible. As the years have passed since A Dance With Dragons hit shelves, the fervor for a sequel has died down, while Game Of Thrones has risen ascendant. The show only gets more popular with each passing season; the seventh-season finale brought in 12.1 million viewers, a high point for the series thus far. 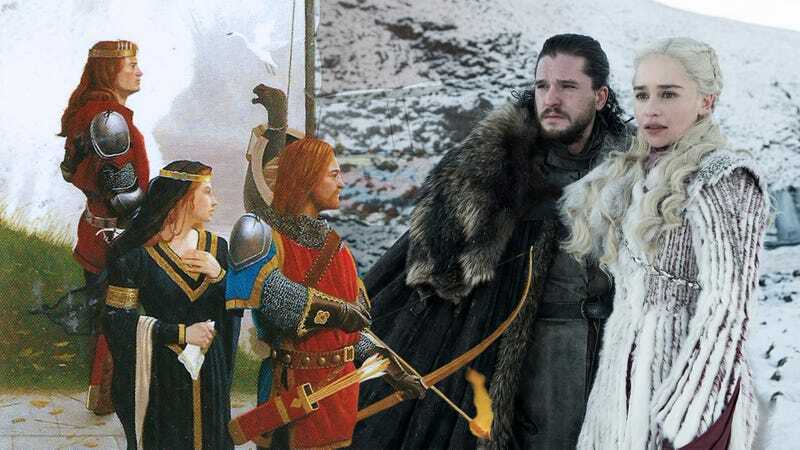 Given that this April marks the premiere of Game Of Throne’s eighth and final season, it’s not surprising that HBO is planning a spin-off, with a prequel series set thousands of years before the original show. There’s a definite hunger for more A Song Of Ice And Fire content, but while Martin himself has published several prequel novellas, as well as the pre-ASOIF history Fire & Blood, it looks like these days, most people are turning to the show for satisfaction. This is where things get tricky. Game Of Thrones started as an adaptation of A Song Of Ice And Fire, even taking its name from the series’ first book. For the first four seasons, it largely followed in Martin’s footsteps, making moderate changes but on the whole sticking to the story of the original work. Then, some time around season five, the show went past where Martin had written. Showrunners David Benioff and D.B. Weiss consulted with the author on his plans for the what came next, and there’s no obvious sign (like, say, Martin calling foul in an interview) that they’ve ignored his designs. But those designs could only encompass so much, and no matter how faithful they ostensibly are, having the adaptation reach a conclusion before the source material does robs that source material of at least some of its vitality. The sad fact is, Game Of Thrones is going to decide the fate of Westeros long before The Winds Of Winter ever hits print. Both Martin and the showrunners have operated under the polite fiction that this doesn’t make Winds (or the even less likely concluding volume, A Dream Of Spring) less relevant and necessary. In a recent interview with Entertainment Weekly promoting the release of season eight, Benioff made it a point to explain that there are “differences” between the show and Martin’s plans, enough to ensure that fans of A Song Of Ice And Fire will still be able to experience the final books “fresh.” Just what those differences are, and whether or not they go against the grain of the ending Martin has planned for the series from the beginning, remains to be seen. That suggests something of a reversal: Game Of Thrones isn’t just telling the rest of Martin’s story before he can finish it himself; the show is doing it better than he could. Whether or not that proves to be true, most of the apparent changes are things that were inherent in the text from the start. Martin introduced the White Walker threat in the prologue of the very first book in the series. They were always intended as the end-game threat, to add context and tension to the constant political intrigue and scrambling of the main storylines. As the lords and ladies of the various kingdoms struggled for the throne, the fighting keeps them from realizing the real danger until it’s practically at their doorstep. So this was always going to eventually turn into a grand struggle for the fate of humanity, good versus evil, light versus dark, the living versus the not-exactly. Maybe the real problem is that Martin (and the show adapting his work) was just too good at all the political intrigue that was ultimately going to prove to be more or less besides the point. The novels were at their strongest not when they were dealing with supernatural threats, but when they showed the consequences of short-sighted thinking and corruption in a brutal world. You don’t need White Walkers and dragons in a land where trusting the wrong person (or not trusting the right one) could end with your head on a spike. Not to mention the fact that the Walkers, while they make for impressive visuals, don’t have an ounce of the nuance of the Lannisters. Hell, even The Mountain has more depth. Really, Game Of Thrones hasn’t ruined A Song Of Ice And Fire so much as it has brought the series to its inevitable conclusion. It remains to be seen if that conclusion will make everyone happy or not (spoiler: probably not), but regardless, it will be an ending. If Martin ever finishes books six and seven, it will be in a world that has largely moved on from that version of his tale. And while that seems a bit sad, it might also be for the best for the writer. If the reason Martin has been struggling so long to finish his work is because of his concerns over living up to expectations, it’s possible that being rid of those expectations might allow him the creative freedom he needs to see things through. It might also rob him of whatever impetus to finish he has left. Only time will tell. Fans will at least get an ending, even if it’s not necessarily the ending they wanted. Given how things so often go in the Seven Kingdoms, that’s not entirely inappropriate.